This modification will cause the Forward relay to be energised by the ignition switch. When speed is zero, this relay will not switch off (until the ignition is switched of) so the motor will not be shorted out. Be aware that (as with all controllers) there is still an internal flywheel diode which will prevent the motor free-wheeling in the reverse direction. 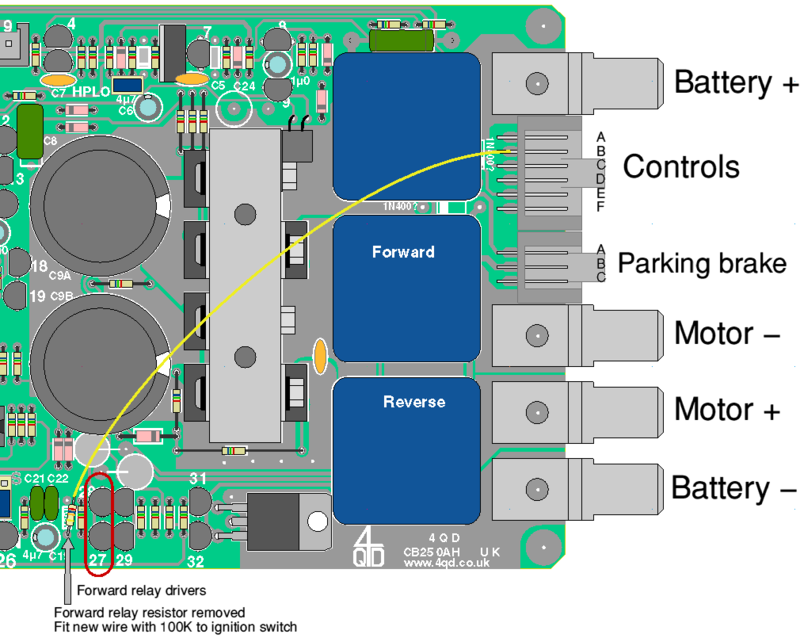 With the forward relay permanently energised, the controller will not operate if reverse is selected. The direction relays are driven by complimentary darlington transistors, as shown in the circuit. Tr 27 and Tr30 control the forward relay. The optional extra resistor is used on 36v and 48v controllers only. The base resistor that drives Tr27 must be removed and a new 100k resistor fitted with a flying wire to the ignition input as shown in the second diagram. There is no base-emitter resistor on Tr27. It is a super-darlington arrangement, so needs very little current to energise it. This means that a small amount of leakage into the ignition line (e.g. water on the ignition switch) could pre-energise the forward relay. If so, the controller’s main relay may not energise when required. 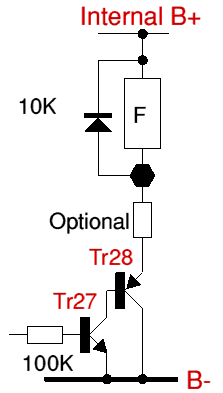 A resistor b-e on Tr 27 would define the operating voltage. E.g. with 3K3 b-e Tr27 would not energise until about 18v on the ignition line.